Following World War Two, a flood of pro-peace designs by Pablo Picasso flowed into popular culture. 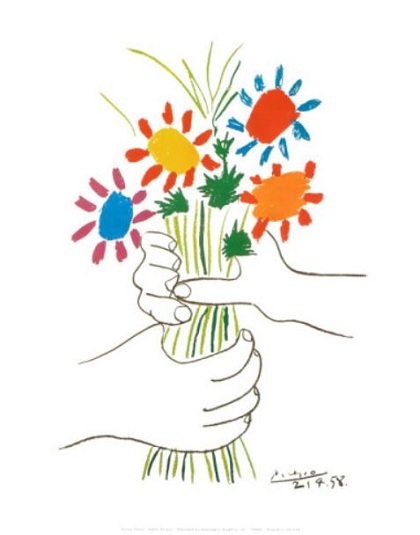 His "Petites Fleurs", which appeared as a small poster in 1958, was one of the most admired designs and sold thousands of copies. Both the struggle for peace and the heart's celebration at its attainment are clearly revealed by the obvious emotions of the two different hands. The style is also fascinating: This picture was done in basically the same style Picasso had invented for "Guernica", the horrifying great mural that he made two decades earlier to show the onset of the war.